Julia Cupman discusses the ways in which many organisations – especially larger business-to-business companies – adapt their marketing strategies in the face of recessionary pressures, and determines which marketing strategies can be considered the most effective for an economic downturn. Whilst the principles of marketing stay the same regardless of the prevailing economic environment, it is the practice of marketing that changes, especially in a recession. In response to the slump in demand and decreased sales, many marketing teams have had their budgets slashed and their resources cut back. These challenges, along with volatility in the marketplace and constantly changing customer needs, mean it is difficult for marketers to determine what marketing strategies to employ. There are a plethora of factors that influence the appropriateness of a certain marketing strategy for a particular company, including the overall objective of the strategy, the level of available human and financial resources to implement the strategy, the geographical scope being considered and the elasticity of demand in the marketplace, to name but a few examples. Common to all strategies is that some kind of payback is required, in that every strategy should seek to provide a return on investment. 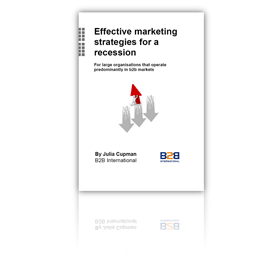 This eBook explores strategic reactions to a recession and examines the findings from a survey of 310 marketing professionals who work in b2b corporates across the world. Various marketing strategies are discussed, with a particular focus on what makes a strategy effective in turbulent times.